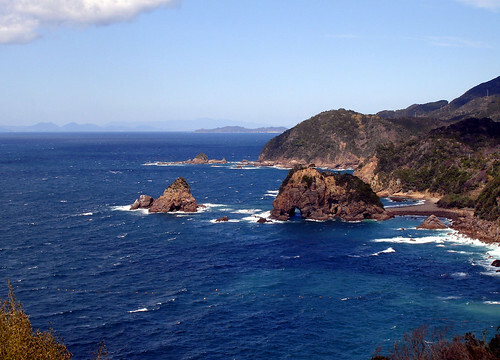 The Hayasui Seto separates Kyushu and Shikoku, two of the main four islands of Japan. 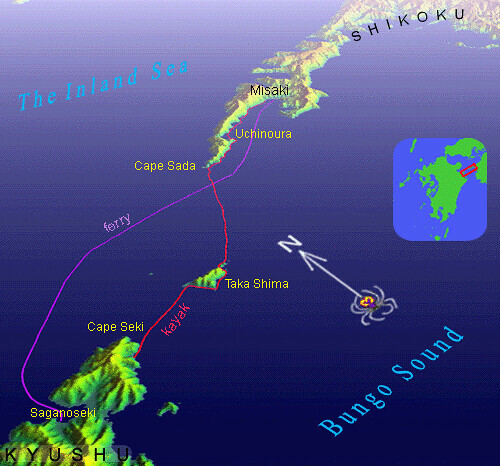 It also connects the Inland Sea with the Bungo Sound and hence the Pacific Ocean. Two such large and very different bodies of water do not meet smoothly, and the strait’s literal name, “Fast-Sucking”, bears some witness to this. Well-known as Japan’s ‘skinniest’ peninsula, a 50-km long, but only 1-4km wide finger of land that culminates in Cape Sada on the strait’s northeast (Shikoku) side, forms an enormous natural dike that further concentrates tidal currents. At spring tide, these reach 8 knots, so that even ocean-going ships experience some trouble passing through. Violent eddies, haystack waves, and other phenomena are common. Under such conditions a kayak would surely get swept away like a toothpick down a storm drain. It was therefore wise that we chose a neap tide, and a calm day, to make this exciting crossing ourselves. There was an ulterior motive: we were delivering a special-order, 3-person kayak custom made by Water Field for a Mr. Sugimoto, a Shikoku kayak guide of some renown. Mr. Sugimoto was to ride the ferry to Kyushu to take part, and the man in charge was none other than our good local friend and kayak guide Kenji Suemitsu. With Leanne and I that made four, so I took this opportunity to take the Hayate I’d used on my Amakusa circuit for another spin. But would I be able to keep up to such an ably crewed triple? 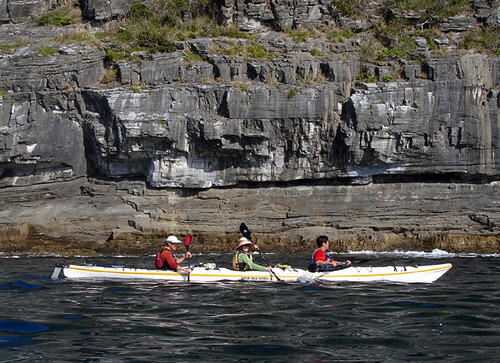 In particular Mr. Sugimoto’s reputation as a Herculean paddler preceded him across the straits. On Sunday, Leanne and I made the 5-hour drive across Kyushu, passing on the way through the enormous ancient crater of Mt. Aso, Kyushu’s premier tourist destination. (The volcano still churns and occasionally hurls smoking boulders into the crowded parking lots.) In the late afternoon we reached Honjo, one of our favorite climbing areas, sporting limestone so steep that one makes more horizontal than vertical progress climbing here. My arms and back were still not recovered from last Wednesday so, needless to say, my performance in a powerful place such as this left a lot to be desired. We promised ourselves we would come back soon in spite of the distance. In the evening, we drove on another hour to the industrial town of Saganoseki where we met with Kenji at a nearby beach and parking lot that was to be the tour's departure point. Mr. Sugimoto, a swarthy and energetic man in his early thirties, arrived on the late evening ferry and was shuttled in by Kenji. After a beer or two we all retired to our tents and slept rather hard until dawn. In the morning, we spotted a car at the ferry terminal, and got the boats ready. As soon as the triple was afloat it took off eastward at eyebrow-raising speed. Yours truly in the Hayate, straining as he might, was not gaining any ground in their wake. 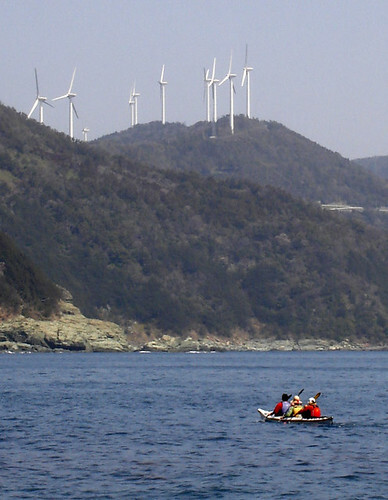 To wit, Mr. Sugimoto, head down in the bow seat, was spinning his paddle like a windmill. Only on the rare occasion when he took a break was I able to catch up. Glancing at the GPS revealed a shocking truth: we were hydroplaning toward Shikoku at 10-11 km/h! The triple could probably circumnavigate Shikoku like this, but how long could I keep this up? Hardly 30 minutes went by and we were alongside the shores of Takashima, a dramatic and scenic island still on the Kyushu side of the main strait. Sweating profusely, I was hoping for a break at a nice beach that presently came into sight, but it was not to be: the triple steamed on along the coast. Passing a rocky cape, I swerved through a narrow gap in the rocks while they cut a wide arc along the outside, briefly surrendering their lead. But I didn’t even have time to wipe the salt and steam off the camera lens to profit from my only chance to take a head-on picture of them. 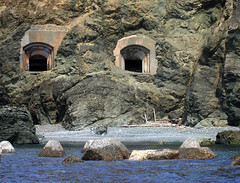 At the east end of Takashima, land gives way to the sea in a series of steep rocky islets riddled with caves, cliffs, and narrow passages. 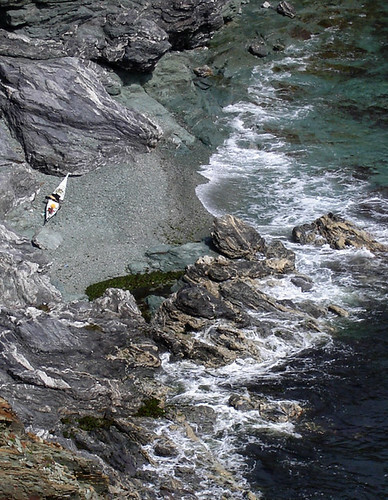 This is the kind of seascape that every kayaker looks and hopes for along his travels. 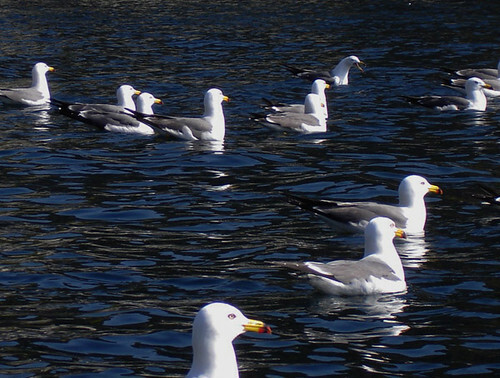 This morning, several thousand noisy seagulls dotted the water and rocks, or swarmed in the air like insects. Masses of yellow flowers matted the ledges of the cliffs. Even the triple slowed to a glide, its crew enjoying the spectacle. 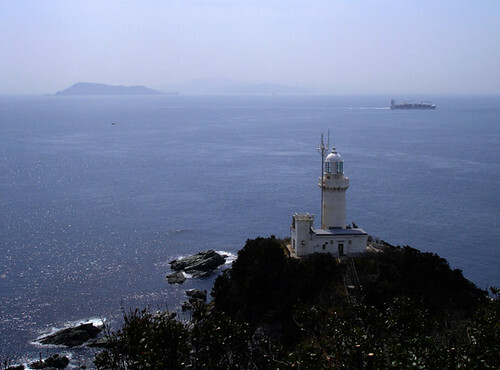 A lighthouse perches on the very last rock of Takashima, marking the western limit of the waterway to the hundred or more of oceangoing vessels that pass through the strait each day. It is 8km to the lighthouse at Cape Sada on the other side. As expected, once on open water the triple resumed its express speed. In the interest of staying reasonably together, I am sure they had to wait for me occasionally, but I was finally finding my own rhythm. Additionally, my boat had an easier time surfing on the occasional standing waves, and in such places our speeds were matched. We snuck through a lucky gap in the shipping traffic, having to wait only once sandwiched between a ferry and a freight ship who were themselves busy avoiding each other. We also had significant current against us but even so we made it across in just over an hour. Steep scenic cliffs ringed the cape, and we admired these as we motored along ever forward. The triple nears Cape Sada in current-induced standing waves. Old cannon emplacements at the westernmost point of Shikoku. Finally, we pulled up at the beach near the village of Uchinoura. We enjoyed a relaxing break while Mr. Sugimoto distributed packages of PowerBar gel, a luxury we hadn’t tasted in a long time. From here, I decided to head back. I wanted to land and walk around the trails near the Sada lighthouse, visit the remains of the WWII artillery installations we had spotted on our way in, and still have time to get back to our starting point just as Leanne and Kenji would be arriving there by ferry and car. 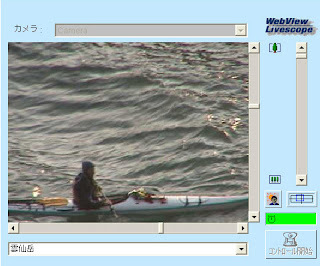 After a hearty wave good-bye, Mr. Sugimoto again put paddle to water and the triple was off. Within minutes they were just a speck on the sea, dwarfed by the 19 wind turbines stuck into the spine of the narrow peninsula beyond them. Enjoying the excellent boat I was in, the beautiful scenery, a good tail breeze and favorable current, I cruised back along the coast, passing on the way a reef curiously named Hakase-Baya, or Ph.D. Rock. I wondered what historical character this name honored in an inhospitable place like this. Probably he was a misfit and a wanderer like myself: a kayaker and ad-hoc English teacher with a doctorate in theoretical physics. 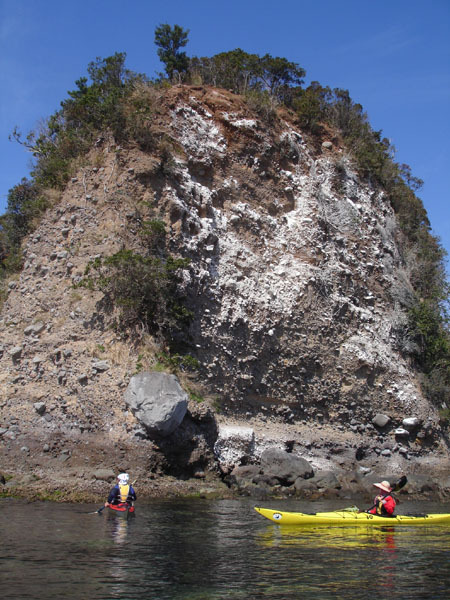 Walls of beautiful green gneiss towered along the coast, riddled here and there with caves I explored, careful not to scratch the borrowed boat. The Water Field Hayate in its natural environment. After a tricky landing at the cape, I walked the trails and enjoyed the views. Surprisingly, the steep up-down trail was teeming with tourists also eager to visit the lighthouse, the trail’s exertions visible plainly on their exercise-starved bodies. Looking towards Kyushu across the Hayasui Strait. 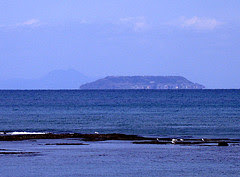 Taka-shima is visible; to its right Cape Seki can just barely be made out on this somewhat hazy day. Shipping traffic into ports such as Shimonoseki, Kobe, and Osaka is heavy through through these waters. Soon I was off again, back across the straits to Kyushu. Once on the open water, I found I was pushing myself again as if following the triple. Maybe I had become infected by Mr. Sugimoto’s attitude. He says he has a need to work off extra energy, being too healthy: he never gets tired and has never even so much as caught a cold in his life. Incidentally, he had ordered the triple so that he can shuttle tourists around the water two at a time, like a kind of water-rickshaw. He is lucky having found work that seems a perfect match for this character. At Takashima, all the birds we had seen earlier had all disappeared. The ferry Leanne and Kenji were riding on was plying the water in the distance, and we made radio contact with our walkie-talkies. I made quick work of the final crossing. Another perfect and enjoyable day was complete, and after a dinner of udon noodles at a roadside restaurant, we were ready for the long haul back home. Mr.Sugimoto also wrote a report about our crossing, for a different perspective and text in Japanese, please refer to his homepage. Well, it was a success this time, but it’s remarkable how the expected and the unexpected combined to make this trip yet again different from my previous attempts. From the beginning I knew it would be a bit of a gamble, but as the next available window (that falls on a day I don’t have to work) wasn’t to be until October, I decided to give it a go. In my favor was the best yet alignment of the tides: a flow, an ebb, and another flow each of about 4 meters (in Hondo); that’s about as big as it gets. This was to be followed by a much weaker flow, which too would work in my favor as I made my way up the west coast against the current. Another strong card was the beautiful Water Field Hayate Expedition kayak I had borrowed from Mr. Mizuno (literally Mr. Waterfield) himself; certainly this was going to be the fastest boat I have paddled to date. I had no time at all to test drive it beforehand, only sitting in it once in front of the shop (which felt great), but I put my trust completely in Mr. Mizuno, who seems to be one of those fairly rare individuals that put great care into all that they are doing. It shows at first sight: this boat was no piece of chintz. Finally, I was feeling strong and fit, with no bodily liabilities (last time around I had a bad cold). However, I had been dealt some weak cards as well, the chief of which was the weather. A high-pressure system dominated the weather here, so there was no chance of a sudden nighttime thunderstorm like the one that made me abandon a nearly successful attempt last fall. But winds up to 10 knots were expected, and as luck would have it, would be blowing dead against me in some of the most critical spots of the tour. So I figured: I have a fast boat, a fast tide; hopefully I will make up the time lost to the wind and waves. It seemed to be worth a try. Following the correct track, I had learned from previous efforts, was absolutely key to success. This time I had modified my earlier track in several places, the most significant two being the Hayasaki Strait in the north and passing Hino-shima in the east part of the circuit. The former has some of the fastest currents in Japan (I personally measured 16km/h there on the spring ebb tide), and the way this trip goes one is obliged to fight the current for about 1 hour before it changes in one’s favor. One makes little progress doing this, and it costs precious energy, so this time around I planned to aim the boat at right angles to the current and let myself be carried a considerable distance to the left while making reasonable headway. I figured to gradually make up for this drift as the current weakened, and once it changed, it would flush me back to the right anyway. This method, in fact, worked great, and I gained precious time at no energy cost. At Hino-shima, where I previously experienced a 15 minute delay that basically caused me to miss the boat, as it were, on the entire ebb tide through the ensuing straits, complex counter-currents extend a fair distance offshore. About a month ago, I made a series of measurements there under similar tidal conditions. Determining the extent of the back-current, I plotted a wide arc around the problem area. This also worked like a charm and though the resulting path was slightly longer, I blew past the island at double-digit speeds. I could see the waters colliding and churning only 50-100m to starboard, where going would have been painfully slow. 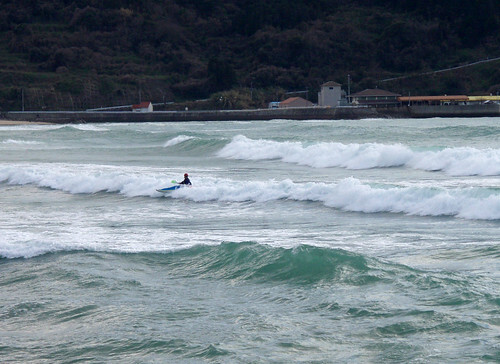 Hinoshima was one of the places where I fine-tuned my path to gain more speed from the current. The old track hugged the coast to cut distance but placed me in a back current/eddy area. The green/blue lines with black dots are actual measurements I made here a month ago; I added schematic stream lines to help visualize the currents. The new track was planned to use the stream for maximum possible speed. It worked great. Such a scientific approach, however, can only go so far when dealing with something as organic as the sea. It’s amazing and hitherto inexplicable to me how much the current conditions differ each time I try this trip. In spite of the large tide, the going near Yushima was much slower than anticipated, for reasons unknown. By Misumi I had lost 20 minutes and I was very antsy taking a 5-minute break there while Leanne remotely focused the live-cam on me to record my passage. I had to make a stop a little later to reconfigure for daytime and to empty water out of the boat (a wave had washed over my open cockpit while I was answering the call of nature). To my credit I managed to do all this in only 7 minutes but now I was fully a half-hour late. By working harder than planned I caught this up in the next monotonous 30km, and by Goshoura, I was still gaining steadily. Thus I entered the series of narrow straits that drain the Yatsushiro sea, and what happened next quite surprised me: I caught the tidal express. My speed soared and soon I was cruising at 14km/h, peaking out at 16km/h through the Nagashima Strait. (Last time, my speed was barely 11km/h, about an hour later in the tidal cycle. Clearly good timing is essential here!) It was now the middle of the day, sunny, hot, and the calm sea belied the speed of the current. I was enjoying myself but still paddling hard, knowing I was soon going to need all the extra time I could get. Passing Ushibuka, I was 1 hour 25 min ahead of schedule. How much was the headwind in the next 50km going to cost me? So far, my body was in OK shape. I would give it my best. But the wind was already picking up and the waves were annoyingly irregular and steep. Just before sunset I took shelter on the lee side of Katashima to reconfigure again for nighttime. This would be the last shelter before the final haul. Not being able to land on the steep rocky coast, this break cost me 12 minutes, awkwardly putting on clothes and stowing gear while floating in the narrow boat. Leaving the island, I wonder what the sport fishermen perched on the rocks thought as they saw me paddle off into the sunset and the open sea in the general direction of China. 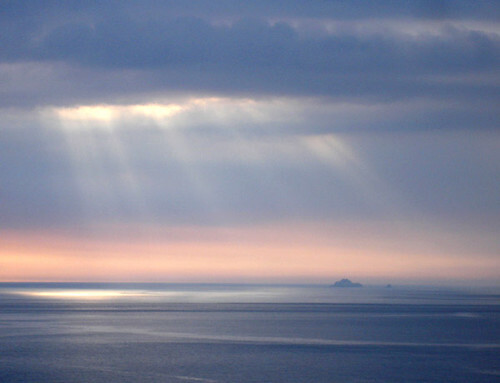 Katashima, Amakusa's most isolated islet, is the south-westernmost land of the archipelago. Beyond, the vast East China Sea stretches far beyond the visible horizon. 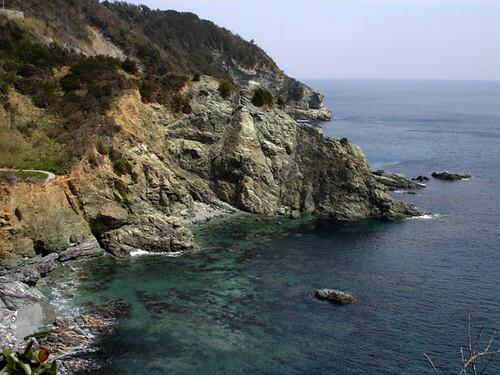 Katashima is a pristine place, famous for its fishing and diving possibilities; amazingly, it contains not a single permanent trace of human interference. In centuries past, people stricken with the plague, smallpox, and such were sadly taken here to die. Today, the island's main inhabitants are a handful of wild boars who swim out to the outlying rocks to feed on fish bait left there by the sport fishermen. 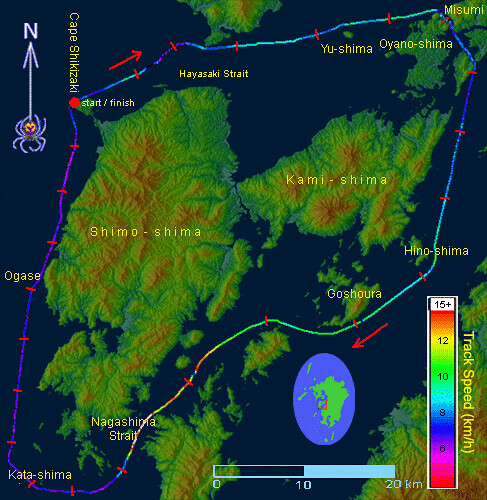 Including Katashima along with several other rocks and islands in the general vicinity extends the circumnavigation by seven kilometers, but also adds some variety and the excitement of venturing onto the open seas. My chosen circuit included this and all other land and drying rocks that are administratively (and therefore somewhat arbitrarily) considered part of the Amakusa district. Thus began the final, torturous part of the trip. For the next 8 hours, I struggled against the wind and waves, steadily losing time in spite of working as hard as I could. I watched the day-old moon set, and a veil of cloud cover the sky. With no stars, or lights on the sparsely populated west coast, the night soon became pitch black. The horizon disappeared, and balancing became a problem (perhaps comparable to standing blindfolded on the deck of a rolling ship). I had lost interest in eating and my energy reserves were being steadily depleted. Now I couldn’t come to terms with how far I still had to go. Here and there, phosphorescent bits of plankton lit up in my wake and speckled on the deck. Psychedelic green tracers were left underwater by large fish darting sideways, startled by the kayak. Creatures unknown and unmoving occasionally lit up deeply underwater with the seeming brightness of a street lamp. Passing the mouths of valleys to starboard, I felt a cold wind draining off the mountains, and smelt the aroma of wood fire from the coastal villages. This was the most beautiful part of the tour: my mind blank, fighting the elements with all that I had left, but feeling absolutely no stress, fear, or despair. I can’t say it was fun, but at the same time it was exactly where I wanted to be. At times as my body wanted to give up, my progress slowed, and I was overcome by bouts of sleepiness. But eventually my mind prevailed and I pushed on. My time advantage having dwindled to nearly nothing, I really didn’t know whether I was going to make it until I was truly in the home stretch. The anticlimactic end came. I wanted to stop awhile and grab a rest before straggling the final two kilometers to the beach, but I became freezing cold nearly as soon as I stopped. Thus I crept on, though at a much reduced pace. At the beach, I had a great deal of trouble exiting the boat, and even more trouble standing up: I could not keep my balance. It was a bit like those Russian cosmonauts that had to be wheeled away from their ship after returning from an extended stay in space. But in about 40 minutes, enough strength returned to me to load the boat on top of the car. Driving home seemed to take an incredibly long time. A roadside nap did not help my condition at all. At the 24-hour convenience they didn’t have the fried chicken that had been floating in my field of vision for hours. It was 4am after all. I made do with a bag of Doritos. After a restless sleep at home, it was time to go to work. I didn’t feel so great that day, possibly because of toxins in my body from my decimated muscles. I had lost 3kg, not all of it water. But I had a very pleasant, long lasting body buzz. Ah, if it only were a bit easier to get to feel like this. Leanne has said this already, but I would like to thank personally to all the people who helped out. Leanne, of course for her support. Mr. Mizuno for the use of his excellent boat (I’m saving money to get me one soon). Mr. Matsumoto of Waterfield Kayaks also for his infectious positive attitude. Kenji Suemitsu, our local kayak guide, for letting me use anything I want from his warehouse. And Nishikawa (aka. Ushi-kun), for lending me his shades after mine were busted while surfing the other day. The circumnavigation was completed in 23 hours 49 minutes. Rik is on his way home now after a beautiful yet exhausting day around Amakusa. Thanks again to Kenji Suemitsu for his help, Nishikawa -for the use of his sunglasses and to Waterfield Kayaks for the use of the deluxe kayak! Here we can see Rik going through the Misumi strait. The image was taken off the Japan Coast Guards live webcam found on the Misumi lighthouse. Rik's five minutes late, but looking great! Go for it Rik! Today's conditions seem perfect for the Rik's solo attempt at the 24 hour circumnavigation of Amakusa. The tides are aligned, the weather is calm, Rik's condition is good, and a top notch kayak was generously loaned by Mr. Mizuno, owner of the famous Kumamoto Kayak maker Waterfield Kayak. Waterfield Kayaks are internationally renown, beautifully handcrafted boats, created with special care and attention to detail. 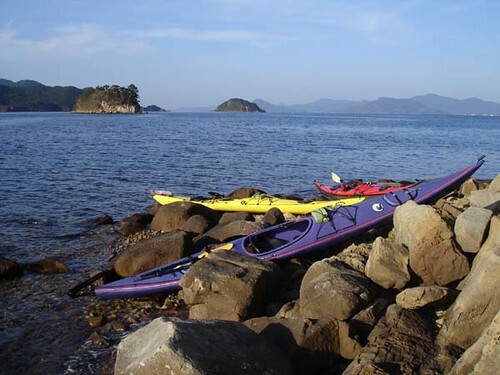 Rik is starting on Amakusa's west coast in Reihoku and is scheduled to be kayaking through the Mizumi strait around 7 am Wednesday, March 21st. As there is a live web cam on the lighthouse in Mizumi, it will hopefully be possible to catch his progress. Stay tuned for updates. Click for details about past attempts. Yushima is a small island situated more or less in the middle of the lower Shimabara Bay. 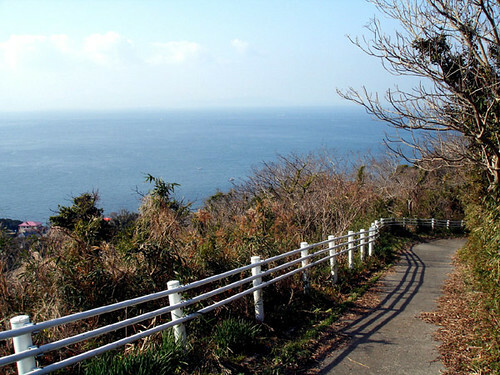 Visible from most of Amakusa’s north shores, it has a unique profile, with steep sides and a flat top. Because of the island’s round shape, this profile hardly changes when viewed from various directions. And like any distant land on the horizon, it exerts a certain pull on the adventurous kayaker. Perhaps the most interesting way to access Yushima by kayak is from Wakamiya beach, a small public facility located in the town of Oniike on Amakusa Shimo Island. From here, the island lies about 15km to the ENE. Although by no means the closest, this access is convenient because it is roughly aligned with the direction of the tidal currents, which in this area are rather strong. Thus one can have the pleasure of progressing at double digit speeds while leisurely paddling along - if one could always move this fast, kayaking would be a completely different sport! We imagined riding the current would be easy when we first set out on this tour a couple years ago. But we ended up struggling both ways and it took two more trips to figure a reasonable route to take maximum advantage of the flow, because its speed and direction varies considerably from place to place due to the influence of the surrounding coasts and the uneven profile of the seafloor. On this map, we show the more or less optimal approach (blue) and return (red) tracks, along with the directions and speeds of the currents at intervals along each track (the scale for the current speed appears above the distance scale). The inbound leg should be done at mid-flood, and the return at mid-ebb tide. This gives one several hours to explore the island while waiting for the tide to turn. 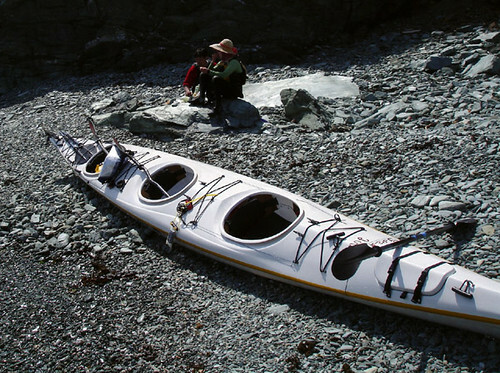 If the trip is attempted at spring tide, each leg will take an average paddler less than 2 hours to complete. However, if you deviate significantly from the tracks or time frames, you will end up fighting the current and spending much more time and energy than that. Take our word for it! Climbing up on land, one can observe the currents around Yushima boil and swirl. This can easily intimidate a kayaker. In any case, this is clearly not a beginner's trip, involving as it does much open water and difficult navigation. And as the tide changes, depending on the wind, the sea may either suddenly calm or with little warning roil up with roaring tidal rapids. Any locals that happen to see our chosen method of transport will be utterly unable to understand how a kayak could be made to navigate these waters. The farmers typically have no direct experience with the sea even living completely surrounded by it in a place such as this, and imagine it a great void filled with demons and other unfathomable terrors. This image is in fact prevalent nearly everywhere in Japan, a fact that surprised us when we first came into this land where the sea is never too far away. But in fact for the Japanese, the sea is the end of the world, and for hundreds of years in the past, when no one was allowed to leave the archipelago, this was literally so. Today, it is still quite incomprehensible to a foreigner that even here in the south of the country, many of the local childern have never even so much as waded into the beautiful sea that's right in their back yard. 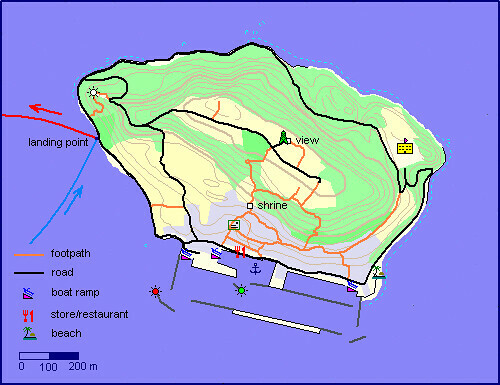 A detailed map of the island, based on Japanese topographical maps as well as our own GPS explorations. The landing point shown is convenient both from the point of approach and departure, as well as offering more privacy than the beach in town to change out of one's wet clothes. There is a small pebble strand to land on and stairs through the concrete seawall; the boats can be carried up and dumped in the weeds on the inland side of the road. After changing out of our wetsuits, we walk the short distance to the village to eat tasty fried noodles in the tiny shop/restaurant at the port. Yushima has the distinction of being the most isolated of the area's inhabited islands; Nokama-shima, the nearest inhabited land, is more than 4km away. This does not sound impressive, and it does show how compact the Amakusa archipelago really is. Yushima is very interesting to us because like many similarly isolated places in Japan, a certain quaintness and charm is preserved here. That is to say, some of the infrastructure is actually more than 20 years old! In a country where things are being ceaselessly torn down, rebuilt, and re-concreted over, one can’t expect a medieval village; it’s still the same clapboard and concrete everywhere, but at least it has some lichen on it, it’s well used and thus somehow more esthetic than the sickeningly uniform and artificial results of the transformation of the natural environment that is rampant most everywhere in this country. We always have fun walking around the narrow steep paths of the village clinging to the hillside, with its numerous cats and bizarrely shaped banyan trees. Higher above, the path breaks through a band of forest and scrub that hugs the steepest parts of the hillside. Climbing steeply through this, we enjoy the wide views of the sea, now from a higher perspective. The town and port rest directly below. Then suddenly, we break out onto the surprisingly flat top of the island. Here, the land had been cleared for agriculture long ago, but as the island depopulates along with the rest of the Japanese countryside, much of it lies fallow now. However, there are a few greenhouses where baby's breath thrives thickly. There seems to be enough of the stuff to supply the needs of all the florists in south-west Japan! A look at the Yushima Elementary School completes the tour. 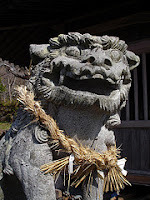 Japanese schools are, like in most other places, a concise look at the native society. What we see here are, most likely, all the kids of the island assembled in front of the spacious building which contains, well, about one classroom per student. Was the government anticipating some kind of population explosion here when they planned this colossus? No, in fact, this situation points only to the gross overspending, inefficiency, and corruption of the Japanese bureaucracy. (Consider also that Yushima, along with 40% of all Japanese towns, still does not have a sewer system per se, or a waste water treatment facility.) The school as well as the concrete seaport, seems to be in fact a thinly concealed buildup of the infrastructure for none other than military purposes. There is so much of this kind of stuff around now, as well as the roads crisscrossing the mountainsides, that to destroy it all would probably take more conventional explosives than even the Americans possess. Japan is currently militarizing even further (in spite of its constitution prohibiting the military, Japan has always had one), and fighter jets, helicopters, camo jeeps or troops in fatigues marching around the mountains are an increasingly common sight. These kids here too, all they need is a change in the color of the uniform. Where Canadian kids run around the playgound at recess, these ones are marched around the yard by their authoritarian teachers. A banner on the school, which rather reminds me of my own childhood spent in a Soviet-bloc communist country, reads, "Learn well, play well" when in fact, any playtime is nearly over for these kids who from junior high school till nearly the end of their lives will experience 12+ hour, 6+ day work weeks and virtually no meaningful free time. The peaceful, almost quaint, aspect of this scene only completes the Orwellian atmosphere here on an island barely a kilometer across, in rural southern Japan. After a few hours on the island, we see that the tide has turned. We descend back to our boats, don our rubber suits, and set out on the sea again. The ebb current grabs us, and Yushima recedes quickly astern. Shishi-jima is a sizeable island which at first sight seems to belong to the Amakusa group but, in fact, is part of Kagoshima Prefecture along with the larger Naga-shima to its south, as well as a number of other, smaller, inhabited and uninhabited islands and islets in their vicinity. Shishi-jima is very sparsely populated because there is virtually no flat land available; it is mountainous and its coasts are steep. It is a true back-waters of Japan and its only notable point is that recently, dinosaur fossils have been discovered there. Though it lies only about 4km from Amakusa, most of our friends and colleagues barely if at all know that it exists. Landing at Hachi-no-shima, the northernmost land in Kagoshima Prefecture. Nishikawa uses is newly acquired rock climbing skills to climb to the top of the lighthouse at Hachi-no-shima. 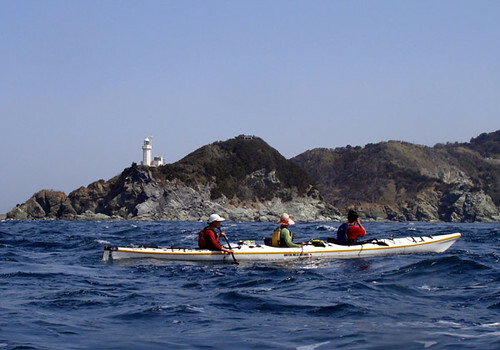 A paddle around Shishi-jima, starting and ending at the tiny port of Tate on Amakusa’s east coast, is about 28km and a fun day trip involving ferry glide crossings, tiny islet landings, fossil hunts and ever-changing views of near and distant coasts as one turns full circle around this island in an inland sea. Tatsuno-saki, the southernmost extremity of Shishi-jima, has a earthen cliff embedded with boulders; it is a nesting ground for cormorants, whose plentiful guano has whitened the cliff face. As February turned to March, we got the first really warm spell of the year. The temperature exceeded 20 degrees for several days in a row, the sun was bright and there was no wind. We decided to go around Shishi-jima with our friend Nishikawa, whose experience was sufficient to go with us on such a nice, calm day. With three leisurely stops, the trip took 8 hours. The sea was extremely clear, which is very unusual for these inland waters, so we could see coral and other sea creatures quite far down along the numerous shoals on the way. This is a Flickr badge showing public photos from vibromama. Make your own badge here.